About Older Models: Information for the Used Loom Seeker or Seller. 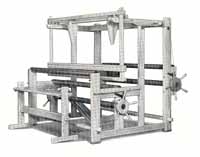 It seems like every week we are contacted by someone who has just purchased a used loom and needs assembly instructions or to order more shafts and treadles. We also hear from those who are hoping to sell a used Glimakra Loom or who are seeking to buy a used one. Often they may not know the model nor size of what they have just purchased or want to sell. Let us help you sell or buy your used loom. We can help you with information about your loom, shipping, cleaning, etc. We will list the loom and help you get good photos of your loom to show it off. For details, contact us, email or 1-541-246-8679, and we will arrange to list your loom on this site with descriptive information, location, photos and other information potential buyers need to know. Information about current Glimakra looms can be found under the GLIMAKRA PRODUCTS TAB. There will be information on loom weaving widths, measurements, countermarches available, what comes with the loom, prices, loom accessories such as sectional beams, double warp beams, fly shuttles, drawlooms, etc. Most of the current information is appropriate for older models as well. Reminder: the Ideal loom is no longer in production and only used models are on the market. 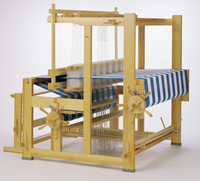 Since the mid 90s, the Ideal loom is 2″ taller, both the breast beam and the total loom height. In the past it had 6 shafts and 6 treadles. The 70cm loom now can have 8 shafts and the 100cm Ideal can have 10. 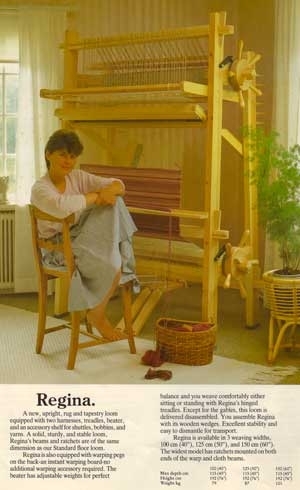 The Standard looms made before 1982 had the lower lamms the same length as the upper lamms. After the early 80s, the lower lamms changed to extend out to the side of the loom. We suggest you purchase new lower lamms for these looms. Lamms are listed on our price list. Prior to the 80s looms had hand tied heddles and linen tie-up cord. Today, Texsolv heddles, cord and plastic pins are used and are available for purchase, along with Texsolv tie-up kits. 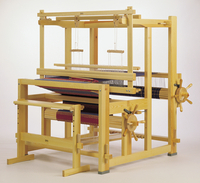 Prior to the 80s, the standard loom came with counterbalance pulleys even if it had a countermarch. Counterbalance and countermarch equipment are listed on our price list. Drawlooms purchased before 1990 are the older style. We have drawloom heddles, drawcords, pattern shaft weights and pattern shaft bars, but not the other wooden parts. Drawlooms are kept in stock. Used Standard looms can have shafts and treadles added, up to 12 shafts and 12 treadles. 16 shafts are available, but all the shafts and treadles need to be replaced. We have loom parts in stock and they are listed on our price list. New loom accessories such as countermarches, drawlooms, double warp beams, sectional beams, flyshuttles, warping frames, etc. will fit older looms. These attachments are listed on our price list.